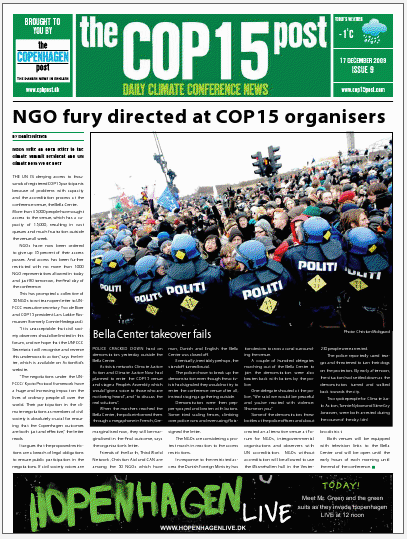 Each morning when we go down to the Hellerup Park Hotel restaurant for breakfast, we pick up a copy of The COP15 Post – a special daily supplement published by The Copenhagen Post (www.cphpost.dk – Danish News in English). The COP15 Post provides another way to be up-to-date on the previous day’s events, but more importantly it has feature articles covering climate change experiences from “people on the climate frontline” around the world. As much as we think we know about climate change, it is an eye-opener to read first hand accounts of on-the-ground indigenous knowledge of changes in local climates and the permanent impacts these are having on cultures and livelihoods. In today’s issue for example (Issue 9, Thursday, December 17, 2009) one of the articles, Canada’s frozen north becomes soggy north, by Simon Cooper, is about two 17-year old Canadian students, Danny Ishulutak, and Janet Evic, from the north-eastern Canadian Arctic village of Pangnirtung, Nunavut. Through their eyes we see the ways in which an ancient culture is impacted by irreversible changes in climate. The very highly-respected Bill McKibben also has a daily opinion column and it’s worth reading just for his column alone. I highly recommend checking out The COP15 Post website – you can read the issues online and/or download the PDFs to read at your convenience. Even the ads will give you food for thought (and perhaps outrage). If only the climate skeptics would read it too, perhaps they might begin to question their head-in-the-sand position. Read and/or Download the PDFs online here: http://cop15post.com/cop15/pdf-download/, back issues are available using the drop-down box links. Categories: COP15 | 2 comments - be the next! I like the COP15 Post. Great approach and well-executed. Thanks for sending along. As I was reading it I saw a tweet that had just come in telling people to listen to the TckTckTck song I told you available from http://www.timeforclimatejustice.org. Ahh, another 6 degrees of separation! Thanks Karen. TckTckTck has a quite presence here in Copenhagen too. Thanks for the link!